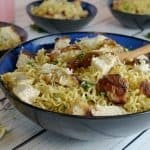 Chicken Ramen Noodles recipe is a fortified home fast food transformed into a genuine family meal, with just a little tweaking on your part. You don’t need kids to appreciate the appeal of this recipe for Chicken Ramen Noodles. Who among us has not gone through at least a brief era of ramen noodles within our lifetime? Maybe it was in college, maybe it was growing up, and maybe it’s still a once in a while food that you go to. Then finish it off in the oven. We modeled part of this Chicken Ramen Noodles recipe after our Oven-Fried Buttermilk Chicken, by starting it in a frying pan and finishing it in a hot oven. We took a skinless and boneless chicken breast and then using standard breading procedure we dredged the chicken in flour, egg, and bread crumbs. 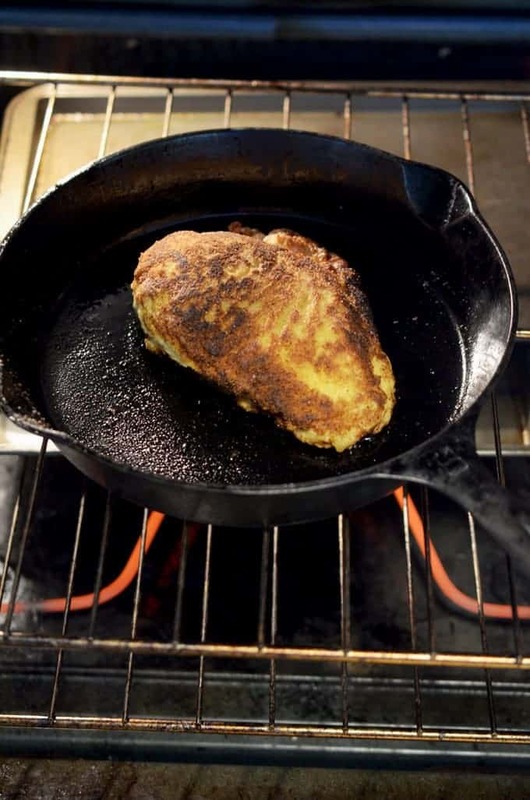 Next, the chicken breast spent a quick stint in a skillet with hot oil atop the stove and then was finally finished off in the oven. No chicken in the house or you just don’t care for chicken? No need to fret. Chicken and ramen noodles made easy! As a little background on how this recipe for Chicken Ramen Noodles came about, I took the four youngest of our gang of six boys to the grand opening of an Aldi grocery store in our hometown. Feeling especially charitable, I promised to each of the boys a treat for helping me out. What kid would pick out ramen noodles for a treat? One of ours is that kid. At the time I had no plans of any sort for the ramen noodles he picked out. Then, I saw the beautiful chicken in that brand new grocery store: skinless breasts and beautiful kid-friendly drumsticks. I picked up a package of both. Chicken Ramen noodles is a fast but delicious and nutritious lunch or dinner. Adding the chicken allowed me to dress up a basic package of ramen noodles, both in appearance and in nutrition. I cooked this up on a leisurely weekend afternoon at our quiet lake oasis while in the company of a good friend who was visiting. 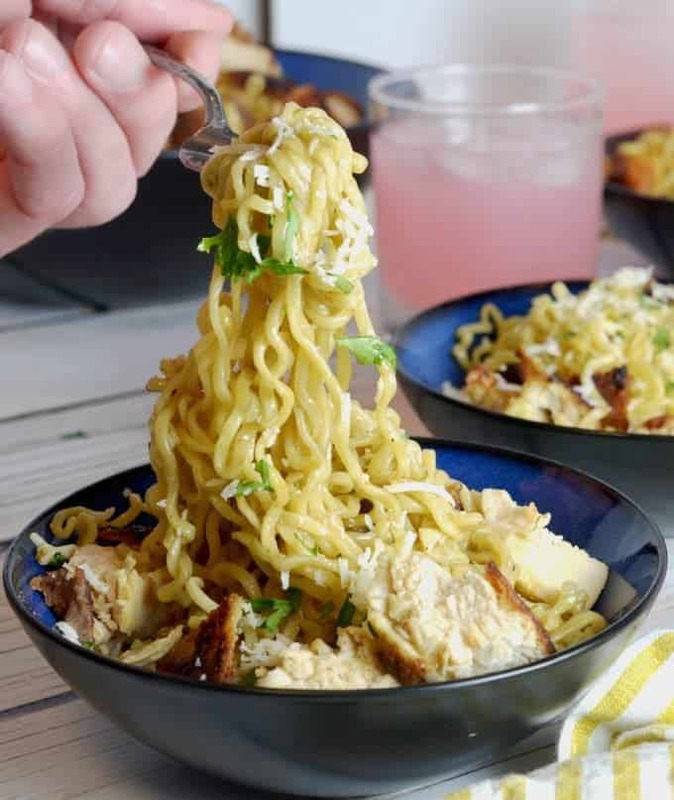 Check out this piece from Delish, featuring a bunch of instant ramen noodles recipes. The boys enjoyed this lunch snack immensely, savoring both the treat of the ramen noodles along with the flavorful additions we me made to turn this snack into a legitimate meal. Give it a try sometime and see for yourself just how good simple can taste. Transform a classic home and dorm fast food into a genuine and nutritious meal with chicken and ramen noodles. 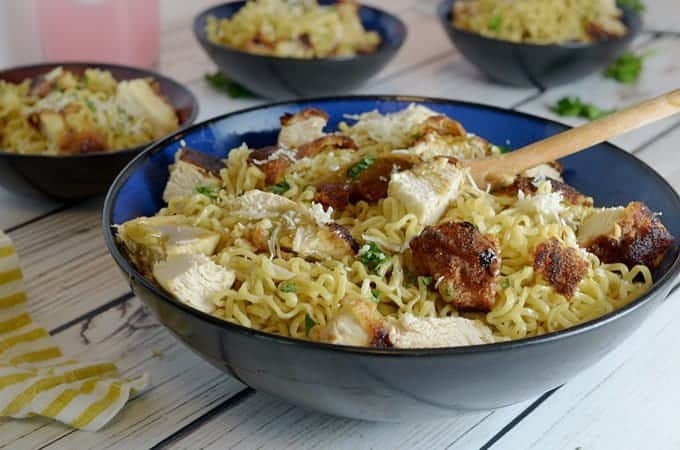 Take an ordinary pantry staple and make this chicken and ramen noodles dish, an easy and delicious meal that the whole family will love. 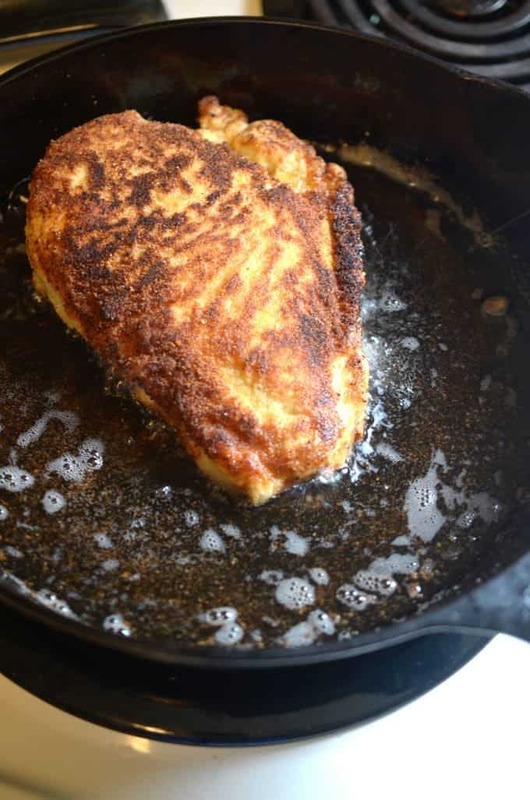 Prepare to dredge the chicken breasts by placing the flour, egg, and bread crumbs in separate bowls. Next, using standard breading procedure, dredge one chicken breast in the flour, then dip it in the egg bowl. After allowing the egg wash to drip "clean", dredge the chicken in the bread crumbs. Repeat process with other chicken breast and set aside. When the chicken is done, remove from oven and allow to cool slightly. Next, prepare the ramen noodles as directed on package. Then, in a large bowl, mix all of the ramen noodles together along with the packets' seasoning. 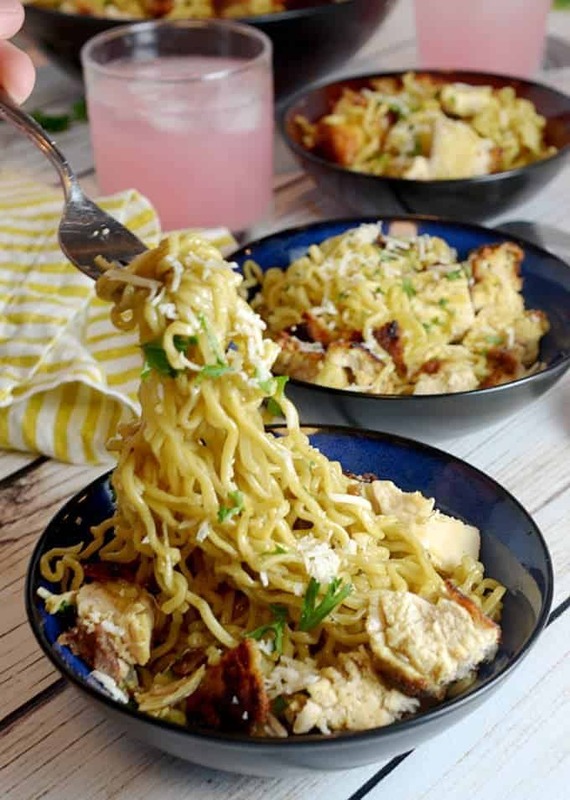 Cut chicken into 1/2" cubes, toss into bowl with the prepared ramen noodles and stir in grated Parmesan cheese. Serve immediately. Garnish with chopped parsley if you want to dress-up this chicken ramen noodle dish. My granddaughters are always wanting Tamen Noodles! So adding chicken is a huge nutritional plus. They will love this! Gonna pin this now! I love ramen and I love using instant ramen in upgraded recipes! I love the idea of using panko crusted chicken to class up instant ramen! This looks soooo good. That sounds like a fabulous homemade version for some ramen! Love how you dressed up a package of ramen noodles for your boys! 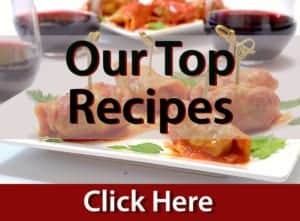 Great protein addition suggestions too! Can really have variety for meals which will make everyone happy! This is calling my name! Way to jazz up the noodles! 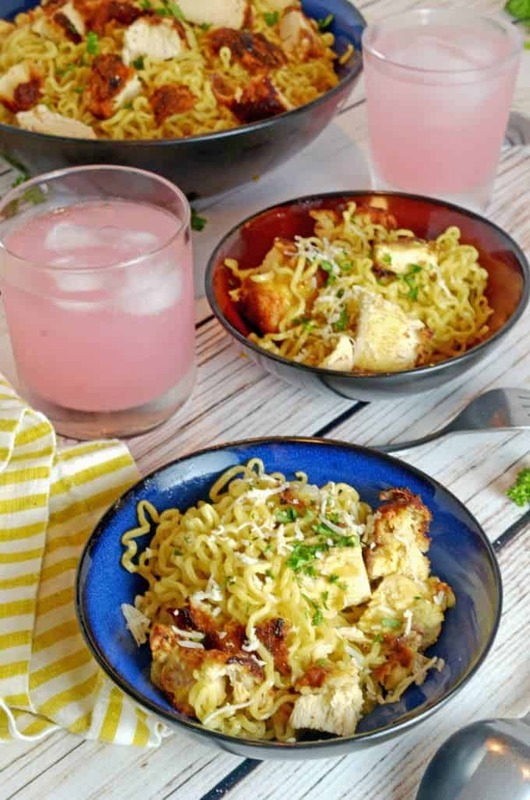 I almost never eat instant ramen as is – I always add a little more to what the recipe instructions call for… I make something very similar to what you’ve done here, but with paneer instead! Yumm! My hubby would love this! He tries to sneak the instant ramen noodles into our house. Haha. But I’m sure this tastes 100% better than their little flavor packets! I love ramen…it is the ultimate kid friendly noodle bowl. I shop at Aldi too! 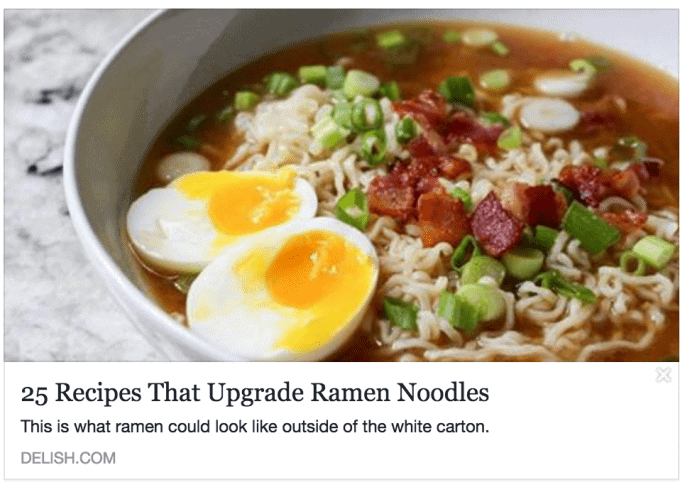 And dressed up ramen is a delicious treat! I love ramen! And with chicken your recipe looks amazing! This looks delicious! I love that this recipe doesn’t have a ton of calories and is super quick and easy to make. Thanks for sharing! Luci’s Morsels | fashion. food. frivolity. Noodles are always a good choice. They are filling and just like a hug in a bowl. This is always our go to comfort dish when one of us is feeling ill. It’s a great way to use up leftovers too. 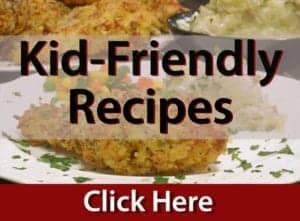 Ramen Noodles are such great comfort food and I love how you have used them here. 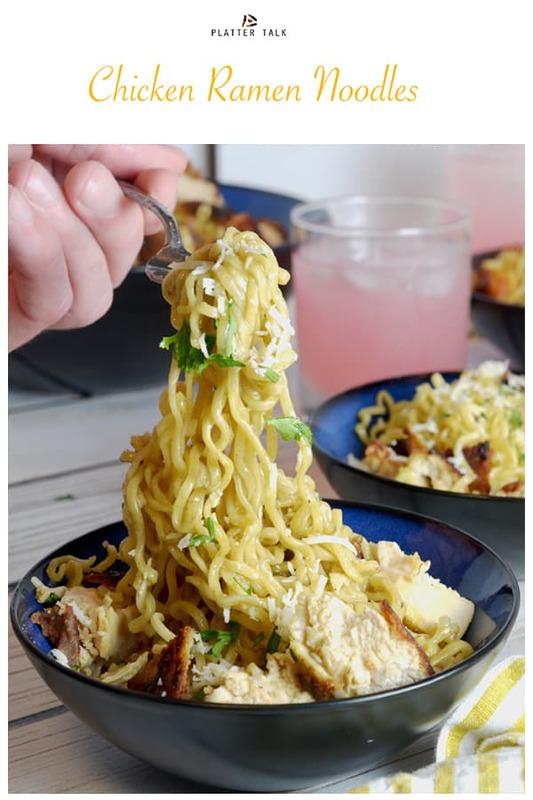 I like that you used breaded chicken for flavour and texture in this delicious recipe – You’ve taken Chicken Ramen to new heights! As always, your photos are fantastic! I love ‘dressing up’ ramen noodles to make them healthier and a real meal! This version looks amazing! Thanks for the kind comments, Beth. It’s fun (and tasty) to think outside of the box, every now and then! Oh wow! This is the ultimate comfort food to me. I love how you dressed it up with the chicken. Yum! I haven’t made ramen in forever, but yes, I’m guilty of practically surviving on them during college. I actually do have a recipe for a ramen noodle salad that’s excellent — I should share it… after I make this!